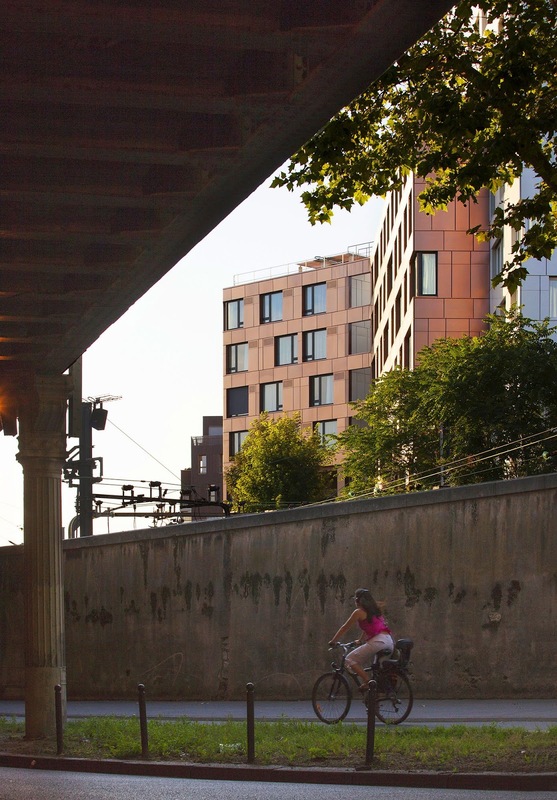 The building unfurls and is folded into the railroad landscape and composite urban fabric. 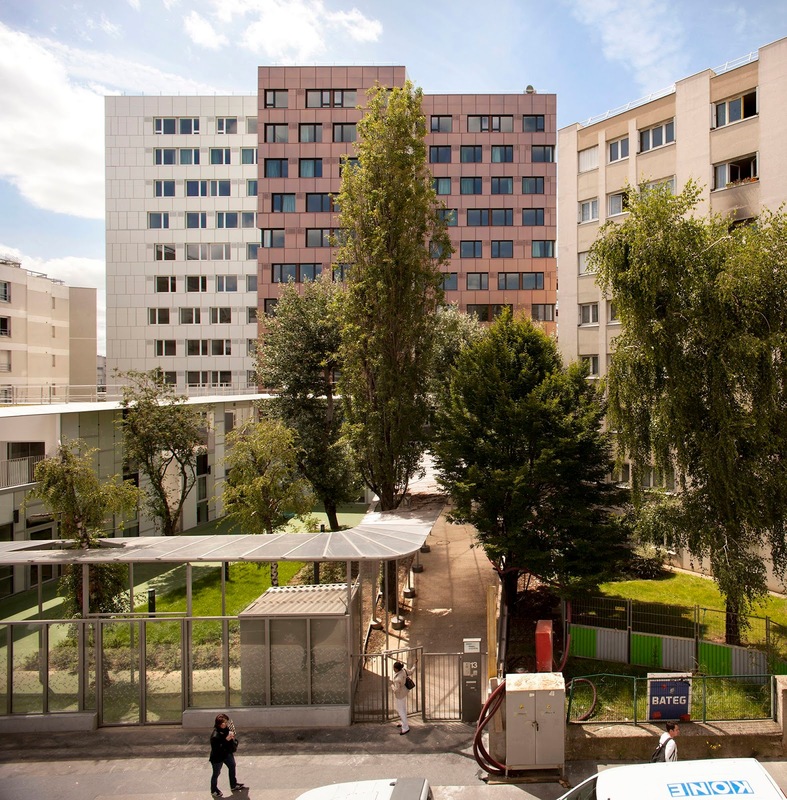 In the new Charolais quarter, a 281 room social residence acts as the masthead of the “development lot” while embedded in the existing fabric of the suburb and its extensions from the 80s and 90s. 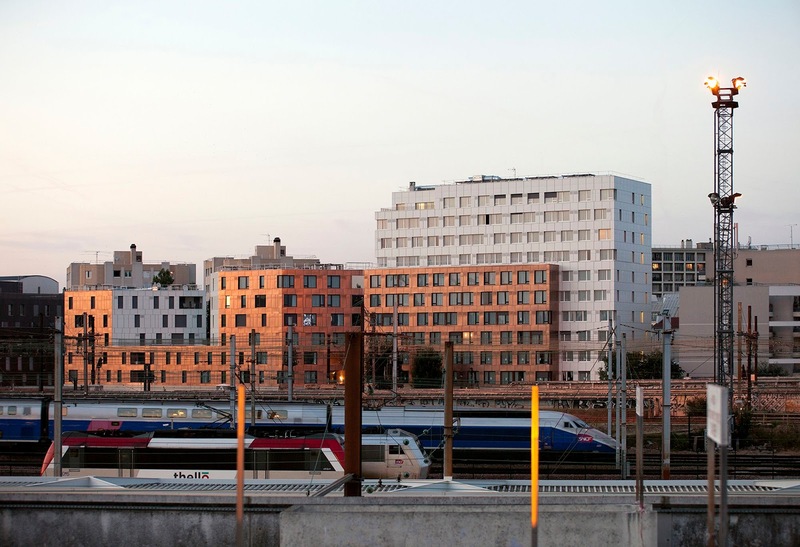 On the land acquired from former railway installations, the building offers a new urban façade on the southside, thereby enhancing the entrance into the city for rail travelers using the gare de Lyon. 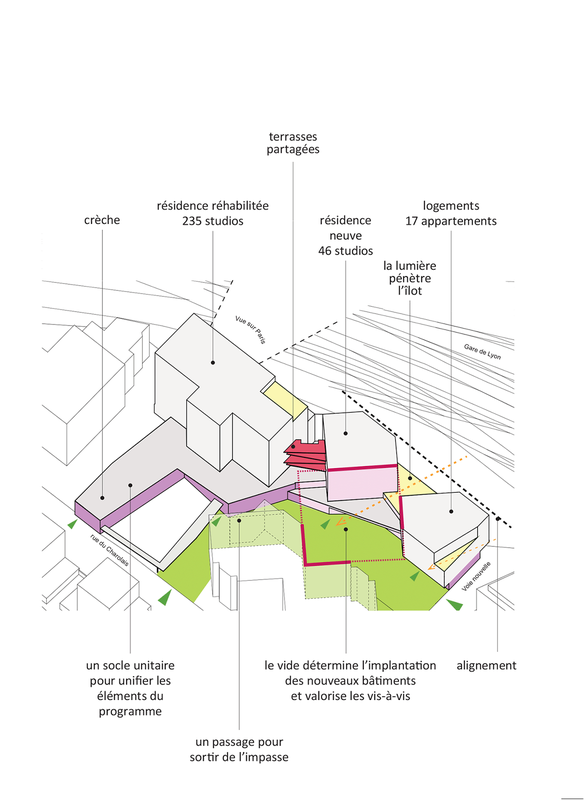 To the north, on the rue du Charolais, the daycare center signifies its presence with its volume projected out onto the street. 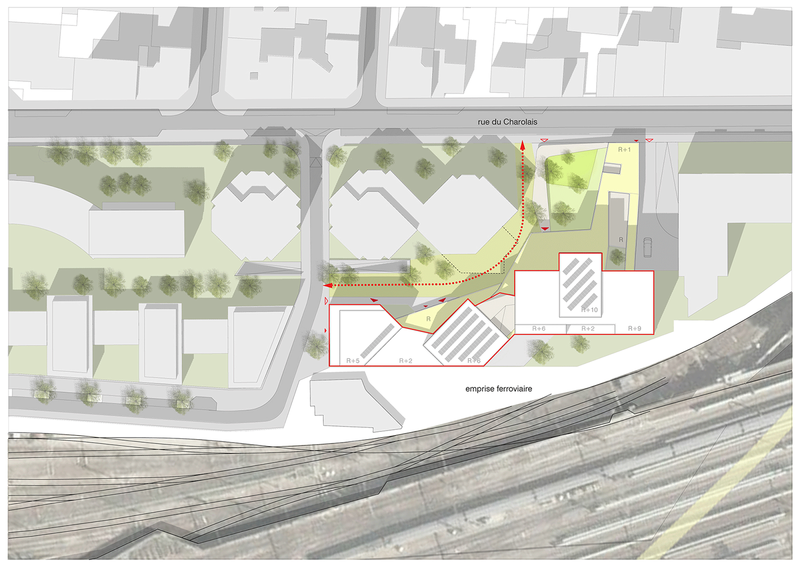 It unfolds within to create a courtyard garden around existing trees to benefit the whole neighborhood. 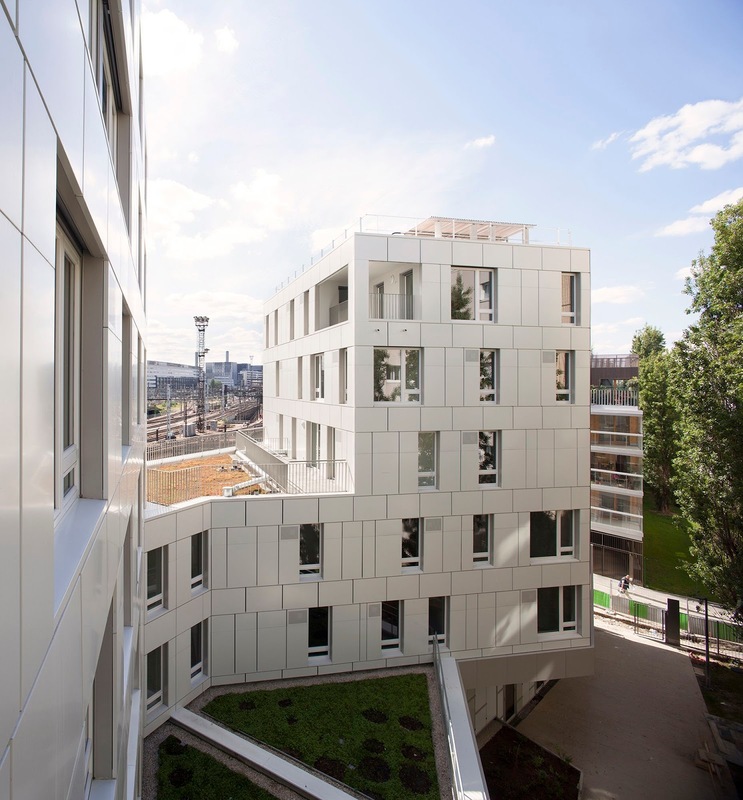 To the west, the new rue Jorge Semprun, is lined with studio apartments and residential housing. The perspectives are negotiated in such a way as to create comfortable views and to structure a common courtyard with existing buildings. The angular geometries are the result of this optimization, which, in addition, guarantees a visual and solar porosity within the islet. 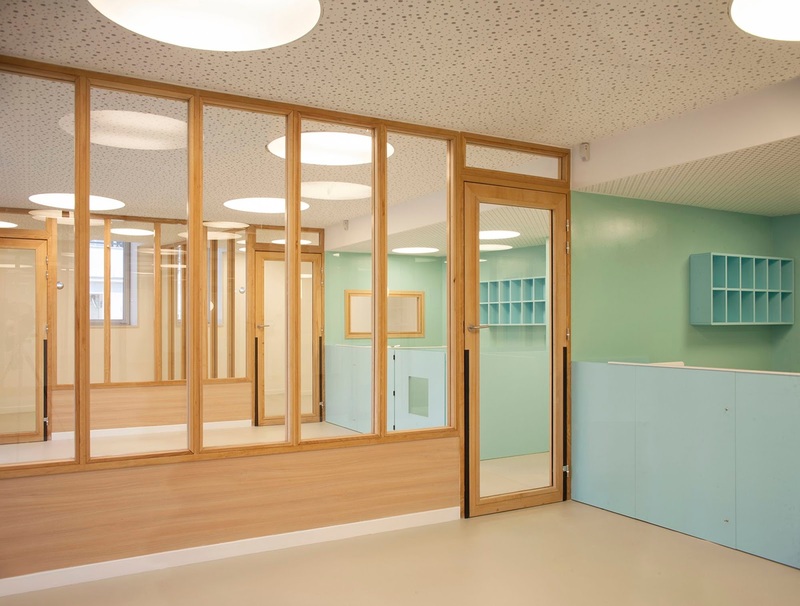 Finally, with the new passageway, we open the islet up completely, allowing for continuous pedestrian circulation from the daycare center to the new quarter. The programmatic mix enhances what is a complex operation on the urban level. 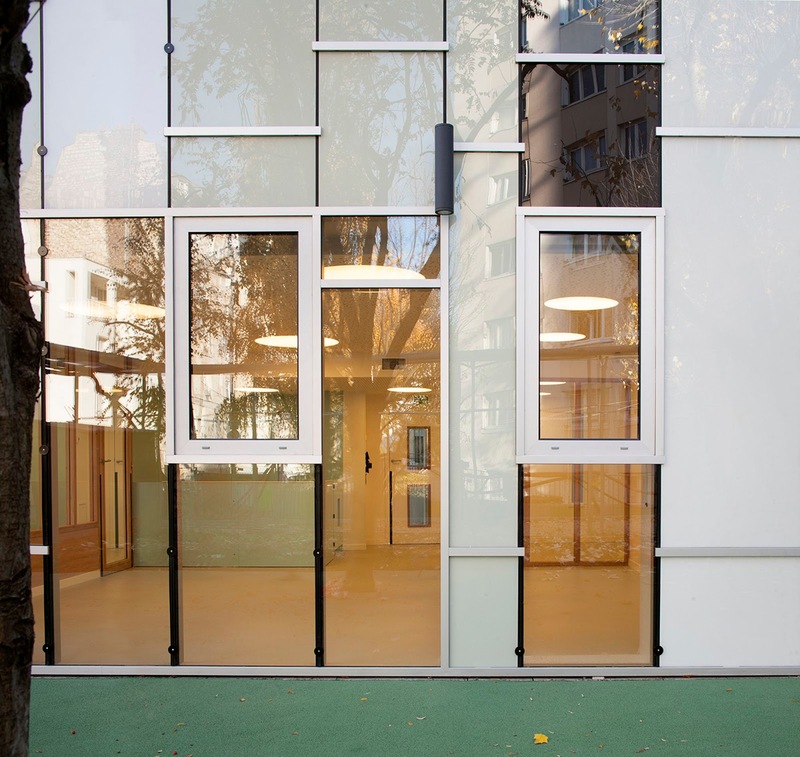 The unitary base is a pedestal associating the collective dimension of the daycare center, the social residence and the apartments, in the same materiality: the curtain wall in enameled and transparent glass. 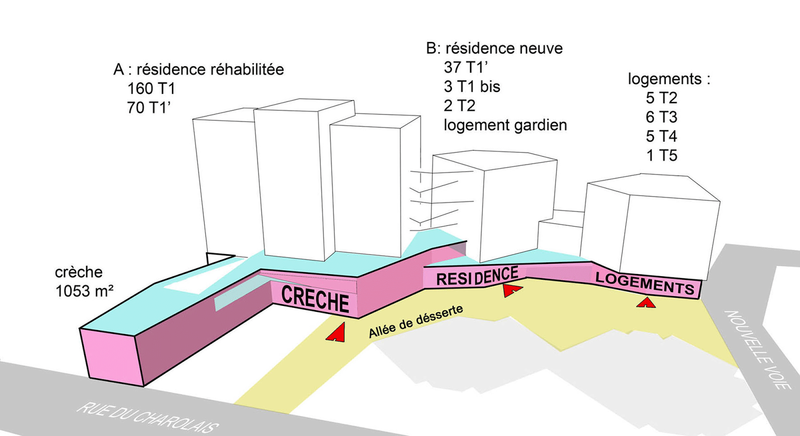 Thus, the urban constraints disappear in the spatial resolution which offers a generous welcome to the disadvantaged population occupying the social residence. 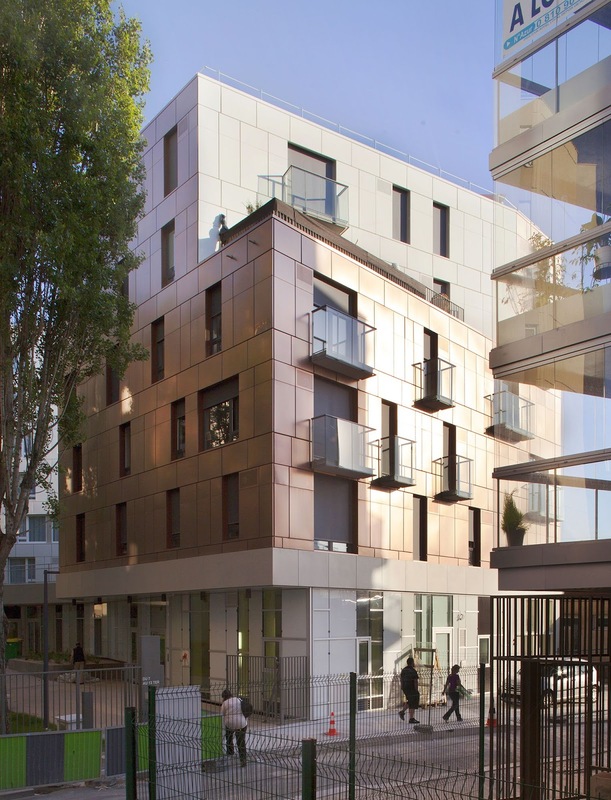 The differences in the shades of the cladding, white sheet metal and bronze stainless steel, facilitate recomposing the urban landscape and ensure the transition from the scale of the industrial area (the ZAC) to that of the restructured building. 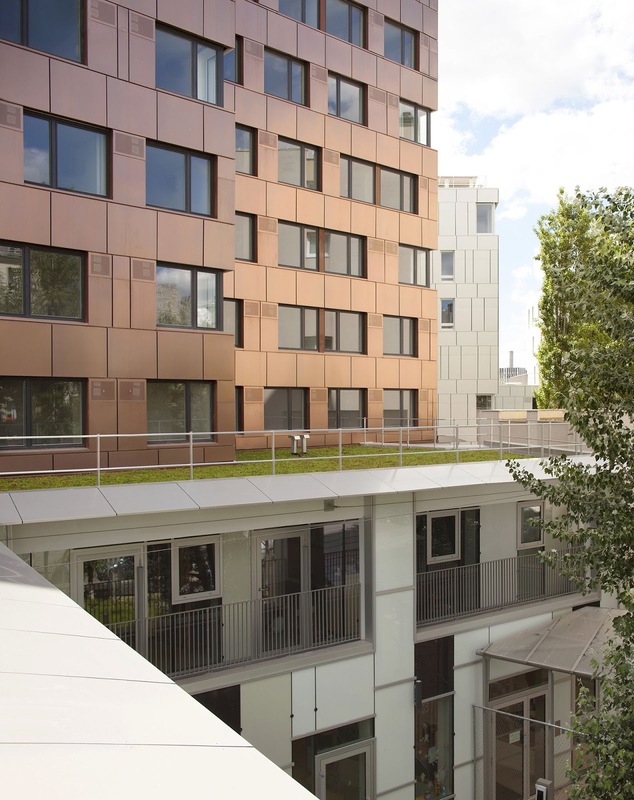 Benefitting from its small scale, it extends according to the principle of a pedestal that is stretched and folded to keep its distance from the main building of the residence and surround the courtyard of the establishment. 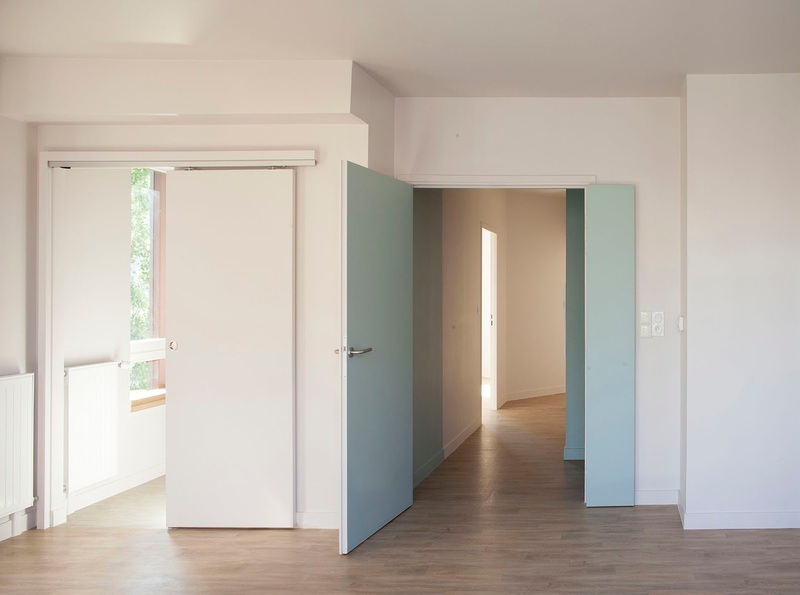 Although the daycare building is spatially embedded within the residence building, it remains totally independent from a functional point of view. The daycare center provides services for 60 children: infants and toddlers on the main ground level and, on a partial level on the first floor, preschoolers. As they are related to one another through their glass partitions, the living spaces feel larger than they are, thanks to reflections and transparencies. Halos of light flicker on the ceilings and provide soft and diffuse lighting. With its plants and white stones, the patio garden adds to the natural light in the heart of the building. 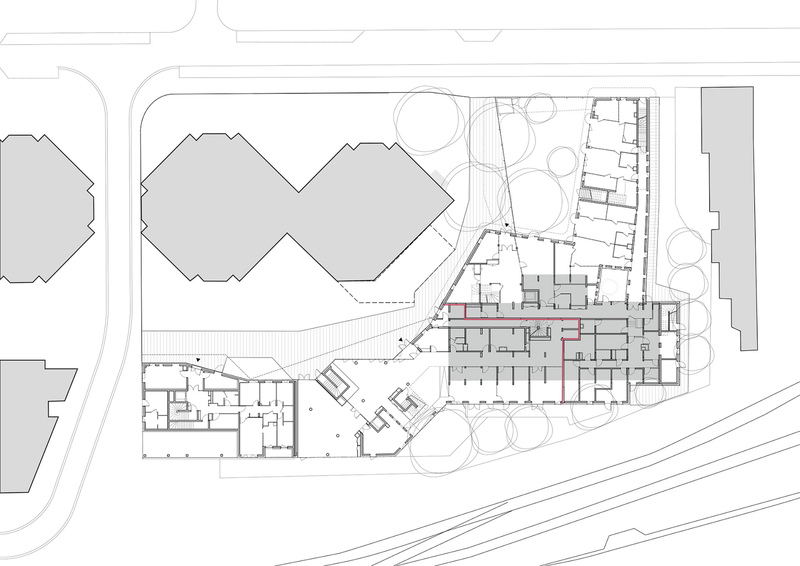 The spacious courtyard (270m2) occupies the part of the site with existing trees. 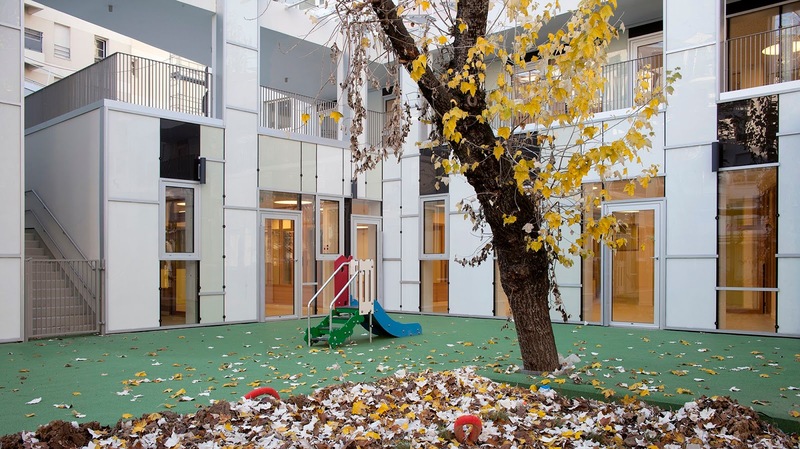 This court is complemented on the first floor by a large playground terrace (110m2) for the older children. 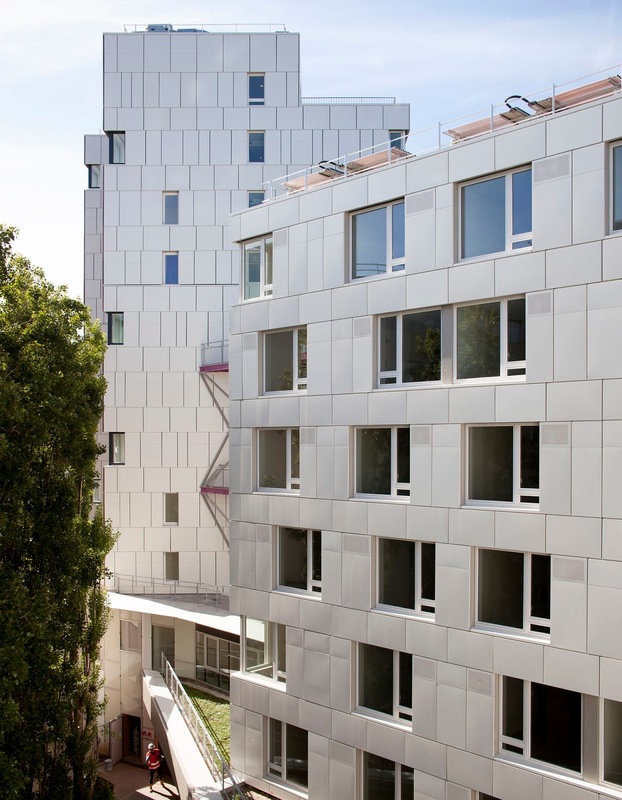 The new building of collective apartments is accessible from the promenade leading to the residence. All the apartments enjoy morning light in the kitchen and double exposures, thanks to the optimization of the distance between it and the existing buildings facing it. Most of these apartments have outdoor space as well. 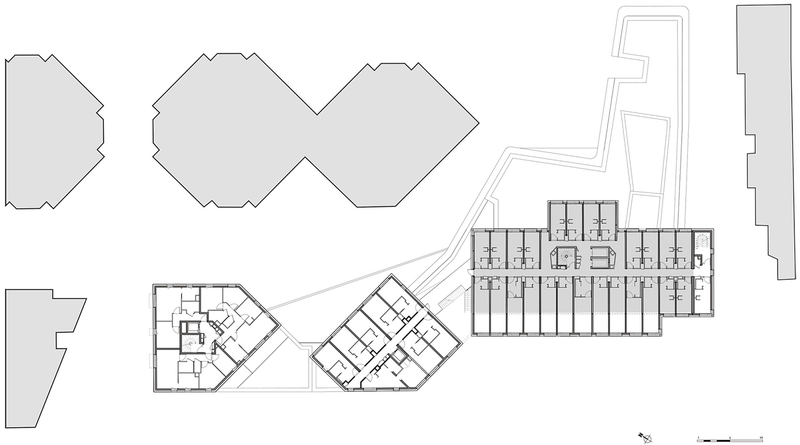 The residence includes a restructured and enlarged portion to the south and the east. These extensions improve the quality of life in the studios. 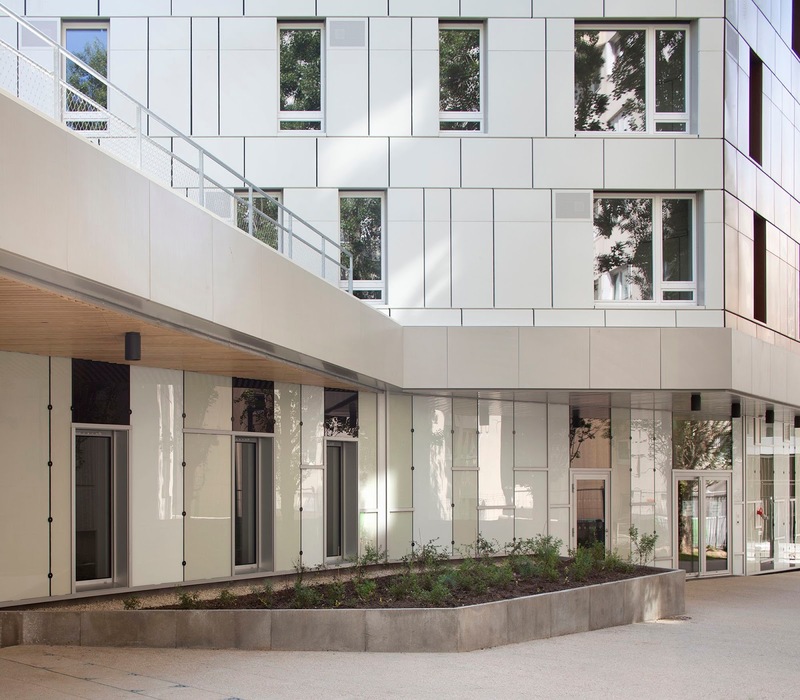 The residence entry hall reunites the new program (46 apartments) to the renovated units (235 apartments) in a very organic space that considers the different places and opens up onto a terrace with a southern exposure. -Exterior, via the terrace-stairwell, offering collective spaces of relaxation at each level. -Interior, via a restructuring of the floor distributions providing natural light throughout. The top floor of the residence benefits from an exceptional view over the landscape, the station’s immense skein of railroad tracks and beams. The advantages of a tight plot (2.3m) allow for decomposing the various usages into sequences and conferring these with a certain degree of autonomy. The sleeping area is thus distanced from the kitchenette. This stretching of the studio provides a sensation of spaciousness. Wide apertures open onto the garden on one side, and out to the wide horizon, on the other.